"A little bit of Jack Bauer and Indiana Jones!" ONLY A MIRACLE CAN SAVE THEM BOTH. As Jesus Christ suffers an agonizing death, a blind Roman soldier named Longinus is miraculously healed after lancing the crucified body, yet though the miracle restores his eyesight, it marks a new beginning to his troubles as he and his friends flee the authorities determined to suppress any word of what truly happened during those fateful events. Two thousand years later Professor Laura Palmer is shot and kidnapped in front of her husband, archeology Professor James Acton, as they try to prevent the theft of the world’s Blood Relics, ancient artifacts thought to contain the blood of Christ, a madman determined to possess them all at any cost. Acton’s desperate pleas for help spur his friends to action, Interpol Agent Hugh Reading, the CIA’s Dylan Kane and Chris Leroux, and the Delta Force’s Bravo Team, all answering the call to help save the woman he loves and the most precious relics the world has ever known. 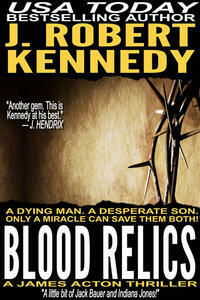 From USA Today bestselling author J. Robert Kennedy comes his twenty-first novel, Blood Relics, a heart pounding thrill ride filled with non-stop action, humor, heartache and intrigue where he once again takes a well-known event in history and expertly weaves it into today’s headlines. The James Acton Thrillers series and its spin-offs, the Special Agent Dylan Kane Thrillers and the Delta Force Unleashed Thrillers, have over 3000 Five-Star reviews and have sold over 800,000 copies. If you love non-stop action and intrigue with a healthy dose of humor, try James Acton today!